Happy Hump Day! I love when we hit the top of the week and start the slide to the weekend…let’s gear up in the car and hit the gas to get there faster! 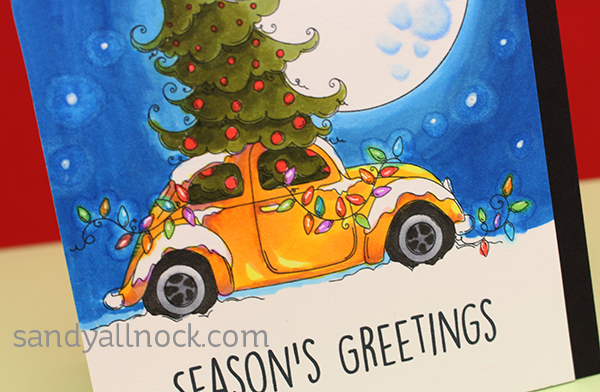 Christmas Bug is a fun stamp set from Stamping Bella that looks like I wish my car did on the day I bring home my tree – I want a sunroof for it to peek out of! Alas, I don’t have one, but it’s a lot of fun to dream while coloring! Watch the video below or click HERE to see it in HD on YouTube. Don’t forget to check out the Holiday Backgrounds collection HERE! What an amazing artist you are. I would love to be able to do this. Love Love this video. Could it be that I drive a Geeko Green VW Bug …..Her name is Puff. Thank you so much for sharing your coloring techniques and talent. I think your style is awesome. (If this is a repeat sorry….thought I had left a comment but never saw it so thought I would try again:). ) Keep those videos coming…love your work. Wow it reminds me of the Bug I wanted in the “70’s”. I love the colors great ole school look. I Love this card because my mother had a bug and a priest I worked for also drove a bug. He passed away in December and the bug was his signature car. He inherited it from his brother. I think I will make this card and send it to his family for Christmas. Awesome coloring and thanks for all the tips on how you achieved this look. The coloring on the sky and the moon looks so realistic! Thank you! This is adorable and so collectible!! It is a work of art – I could see people framing it. WOW!!! Wonderful tips and techniques for this very fun image. Way beyond my skills at the moment, but love the little tidbits that get tucked away as I keep working away at it! Thank you. So super adorable! Love how realistic your light bulbs are! Fantastic! Love this image and all the details you used to obtain the end results. I love VW Bugs and my sister’s husband owned one for many years. Love the technique you used for the glow around the lights and stars. Cute card! Always enjoy watching your videos! Fabulousness. What a great set. 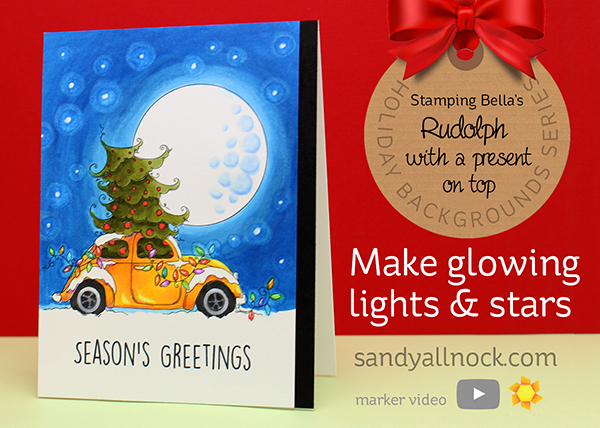 I adore your card and this tutorial – thank you! I would love to win the set to be able to practice your techniques. Fantastic – And it is Mid-Autumn Festival in China – a celebration of the new moon and harvest. My family loves this festival and celebrate it in Hong Kong each year. — I am working on a Mid-Autumn card as I type using your background technique – I will post it to IG when it’s completed! Fun Fun and Inspiration! My first car I ever bought was a yellow VW bug ( yes I know this ages me) I absolutely loved that car and wished I still had it! This brings back such memories. This stamp may just have to come home with me. The coloring is perfection as always and I have been inspired to create backgrounds of my own! Thank you so much! This video was very helpful. I just started using copics. So the tips are very useful. This stamp was already on my wish list but your video helped push it to the top. OMG how clever! I just love the VW bug. I’ll have to try this out when I start my Christmas cards. I look forward to all your ideas and how you make it look so easy. Keep up the great work!! Love your coloring. The stars are amazing. I love this background and that HUGE moon. I have seen one that looked that big and it was awesome as is this card! Fun stamp and awesome coloring! I love the night sky! Absolutely adorable, I love it! Love watching your videos, I have learned so much! Thanks for all you share with us!